Terra were contracted to install 3nr 1200mm pipejacks of drive lengths greater than 1200mm to navigate around the local sports grounds. The ground conditions for these pipejacks indicated that it would comprise stiff slightly sandy gravelly clay with cobbles & possible boulders. All Pipejacking operations were to originate from within sheeted pits. Prior to commencing Pipejacking, Terra Solutions constructed a thrust wall from concrete to distribute thrust loads into adjacent ground. This wall was built at the rear of the pit. A 50mm thick steel plate 4m x 2.5m was lowered into position in between the rams and the concrete wall, this helped to distribute the loads produced during Pipejacking. A front wall was also constructed, and this had to be at least 600mm thick and contained a steel drum shutter to aid the launch of the TBM (Tunnel Boring Machine). A lubrication seal was bolted to the front wall the day after the wall was cast, and when the seal was in position it was bolted to the headwall with rawbolts. Guide rails were also cast at the bottom of the pit, which enabled perfect jointing of pipes before the jacking forces are applied. 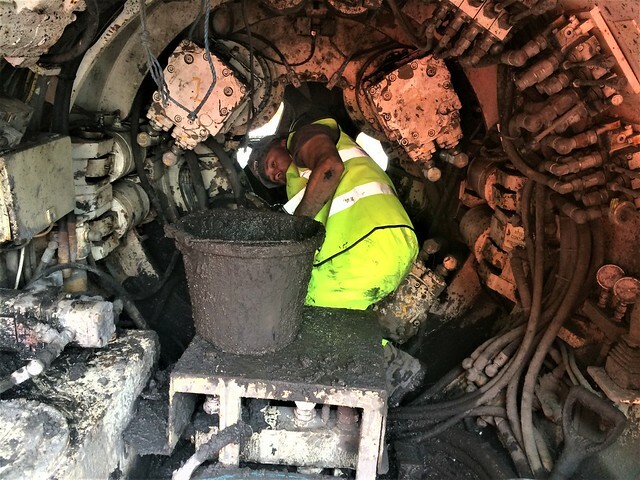 The Pipejacking process used on this job was mechanical backactor, the excavated material falls into the drum and is scooped and transferred to the conveyor belt, which transports it back to the pit for removal. An operator is situated inside the TBM, and can monitor ground conditions and ensure accuracy of line and level from within. With a laser guided setup performed, setting line and level, the 1200mm backactor was driven by three powerful hydraulic motors powered by a power pack positioned on the surface. As the backactor excavated the ground within the shield window, the rams behind it began to expand, using four large hydraulic rams to push the shield forward. The new pipework was then pushed in behind the TBM using the same rams. For safety, the hydraulic hoses, electrical cables and communications cables were bolted to the shaft wall using specialist brackets. Due to the length of this particular tunnel, lubrication was necessary and bentonite was pumped in using a 2” pump with a 1” feed line to reduce the frictional forces acting on the new pipework. On completion of the pipejack the overbreak was filled with a cementitious grout. 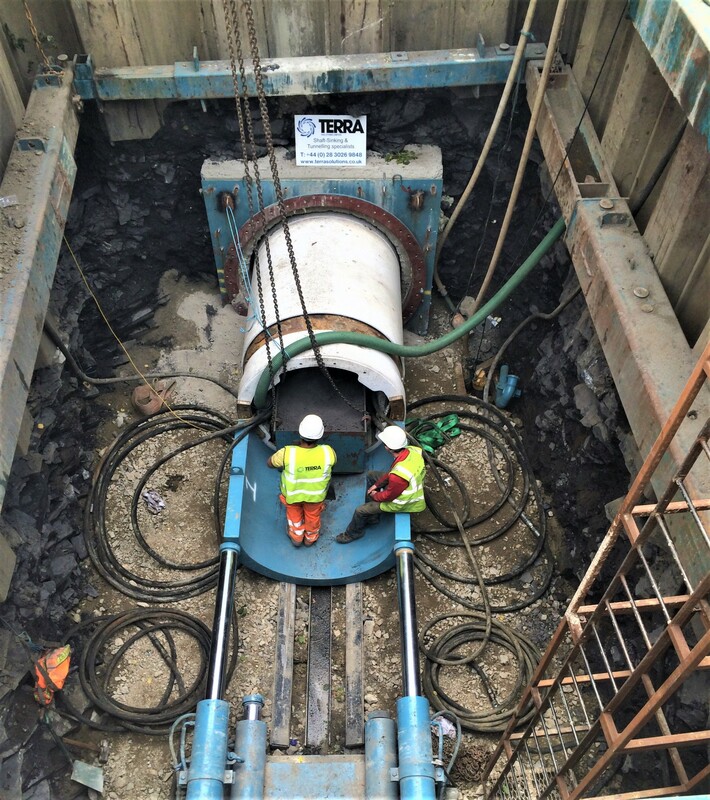 Despite the numerous challenges presented by the surrounding infrastructure present at site, Terra solutions carried out the Pipejacking element of their contract perfectly, as they also did with the microtunnelling, horizontal directional drilling and open cut sections, confirming their reputation as The Trenchless Experts. Find our other Pipejacking projects here.